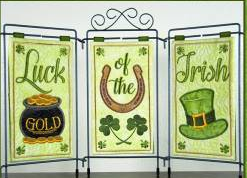 You won’t need the Luck of the Irish to craft this ‘made in the hoop’ salute to St. Patrick’s Day with a machine embroidered applique pot of gold, horse shoe and a leprechaun’s hat. This fun, table top display comes together quickly. Please call the store to reserve your design CD for the class.